Chloe spent considerable time in an animal shelter before coming to Rescue. Yet 6 year old Chloe is described by her New Hampshire family as “the world’s sweetest dog” and “perfect”. Although her family had many dogs over the years, they “have never seen so much love packed into one animal”. 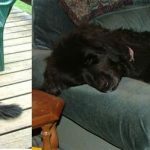 Cheers for your wonderful Newfoundland temperament, Chloe!